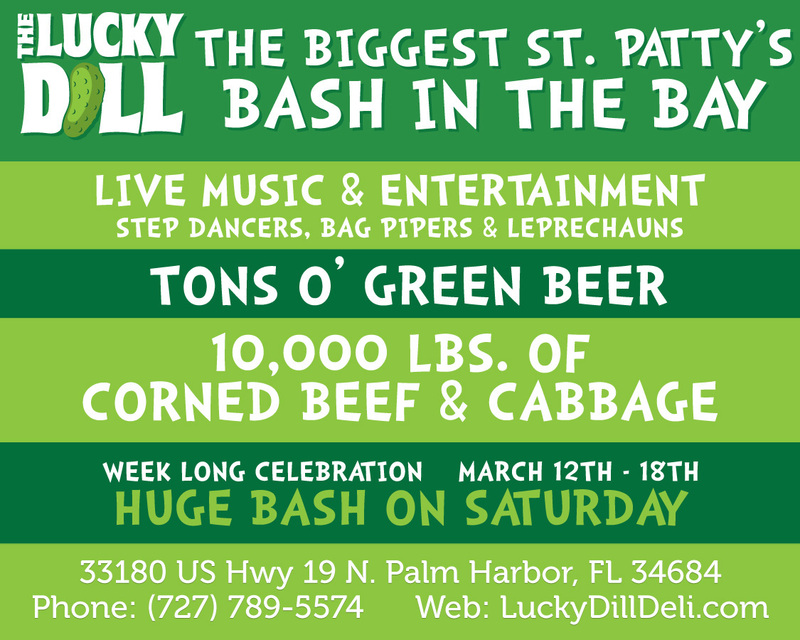 The popular Lucky Dill Deli will be hosting a week long St. Patrick’s Day event. The festivities kick off Monday March 12 at 11 a.m. and continue until at least midnight all week long. The event features live music from Mike Nichols, Sean Delong, D42, Tom Sartori and more. There will be plenty of entertainment including stilt walkers, fire dancers, bag pipers and face painting. Participate in contests and enjoy the full bar equipped with plenty of green beer and unique St. Patrick’s Day cocktails. Baileys Irish cream cheese cake, shepherd’s pie and Guinness beef stew are just some of the highlights on the week long special Irish menu. The feast will include 10,000 pounds of corned beef and cabbage. Free Irish soda bread and St. Patty’s green cheesecake will be available with purchase. The festivities will continue through Sunday night. March 12th-March 18th. Lucky Dill Deli, 33180 US 19 North, Palm Harbor, Florida. 727-789-5574.